In Bangladesh we normally use small prawn for vegetables but where I am living small prawn is nt available. So I find the alternative to chop the large prawn. Instead of coconut paste you can use desiccated coconut and coconut cream . Those are handy to me. 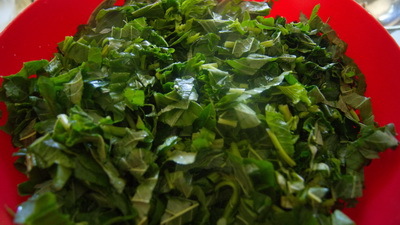 In this way you can cook radish leaf, kolmi shak and other hard leafy vegetables. Again I use sugar because it enhances taste. 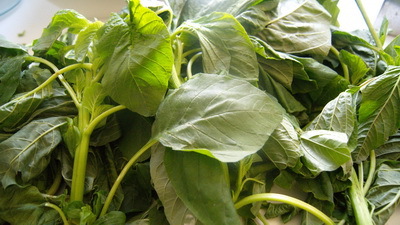 Though I wrote it as a Bangladeshi leafy vegetables, it is available in all Asian grocery. 1. We will take only leaves and wash the leaves 3-4 times. 2. Chop it like the picture and keep aside. 3. Heat the pan with oil on medium high and add onion. Fry the onion till becomes transparent. 4. Add turmeric, garlic, coconut paste and salt and coo k till oil is separated. 5. Add prawn and cook 1-2 minutes. 6. Add leafy vege and sliced chilli and stir it. 7. Cook it under closed lid and cook it till it becomes soft and tender. 8. Check the salt and add sugar. 9. 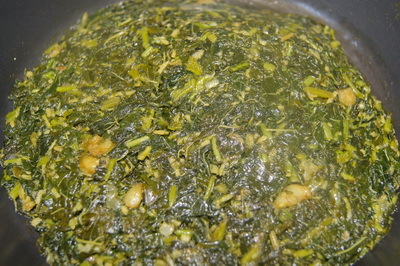 Serve data shak bhaja/ Bangladeshi fried leafy vegetables with rice. Thank you. Your word means a lot to me. Bangaladeshi ra ki sob niramish ranna tei peyaj dai 🙂 peyja chara kichu ranna korte janen 🙂 Illish-maach-eo peyaj ,Shaak-eo peyaj, bhalo 🙁 ami abar Poschimbongo-er bangali , amader theke parle ektoo niramish ranna sikhben ba apander deshe jader apnara Malaun bolen ( Hindu-ra) tara bhalo niramish ranna jane, tader thekeo sikhte paren. Australia giye aar kichu korbar nei naki ? Amar to anek kichu korar ache r korchi o dekhte -i parchen. Apnar pochondo na hole na dekhlei paren. Thanks. Apni niramish bolchen amra niramish bolina .a mader theke sobji ranna shikhben.sobji te to amra bangladeshira piyaj use kori.apnar problem ki.jar ja valo lage se sevabe kore .apnar ki mathai somossa ache?